home-selling experts of HGTV, buyers listed great lighting as the second most important feature in a home aside from location. In today’s floundering real estate market, staging your home correctly is more important than ever. Impressing potential buyers with a home that’s neat, spacious and full of light is absolutely vital. While most people put great care into cleaning, de-cluttering, organizing and staging their homes for sale, not everyone gives a thought to lighting. At the very least, this mistake makes your home seem less show-ready and more of a fixer-upper. To get the best offer possible, you need to treat the lighting inside and outside your home with the respect it deserves. Replacing burned-out bulbs is the easiest and cheapest fix on the real estate chopping block. For mere pennies, make your home feel like a more inviting, cheerier place to live. While you’re replacing the ones that don’t work, spend a little extra to update the ones that do. Switch out harsh, bright white bulbs and fluorescent lights with softer, warmer options. Make sure all your visible bulbs match one another. 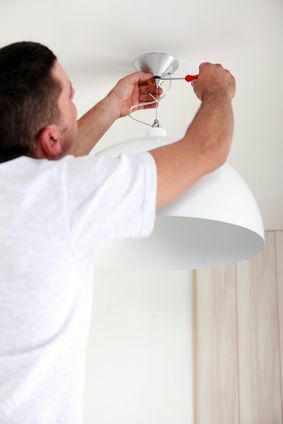 This is especially important in high-impact lighting fixtures such as chandeliers and ceiling fans. Schedule your showings throughout the day to make the most of your home’s windows. Switch out any dark, heavy window treatments for simpler ones that allow the most light to enter. Make sure your curtains are open wide in every room and that blinds and shades are up. Ambient lighting is important in the main rooms of the home — living room and kitchen. Opt for a combination of soft, warm overhead light in addition to task lighting in the places where you need it most — over your kitchen countertops, beside the reading chair. Utilize lamps and sconces that offer modern lighting techniques, like those that direct the light upward to reflect off the ceiling. In bedrooms, use diffused lighting. This gives a room a cozy feel, like two people could cuddle happily there for hours. A big part of selling your home is selling the feelings and emotions that people yearn to experience while living there. If your home has any dark, unlit corners lurking, now is the time to address them. Make sure closets are easily seen into, hallways are properly lit and stairwells aren’t dark and spooky. Even strategically placed press-on lights in small cubbies are better than nothing. Just make sure they’re working when company comes calling. Don’t forget to check the porch light. And if it’s made of shiny brass that’s been in place since the 1970s, replace it with something modern that better matches the style of your beautiful, contemporary home. If your walkway is long and meandering, consider adding simple solar lights to guide the way for nighttime showings. First impressions are huge in the real estate trade, make sure your home shines above and beyond all the others on the block. Before deciding to be a stay-at-home mom, Rebecca ran a successful wine and cheese shop. She blogs about parenting and has loads of tips on staying organized.